When one thinks of Sherlock Holmes, it’s not hard to dwell on the eccentricities embodied in Sir Arthur Conan Doyle’s brilliant fictional detective. He was a genius but his quirks left many readers scratching their heads. The same could be said of another Holmes, but this one was very real. The story of how Dr. Thomas Holmes became known as the father of American embalming could have come straight out of a tabloid magazine itself. The ancient Egyptians were adept at preserving the human body after death, but not for the same reasons it’s done today. Mummification was thought to preserve the body for the next life, so wealthy Egyptians wanted no expense spared on getting that done properly. 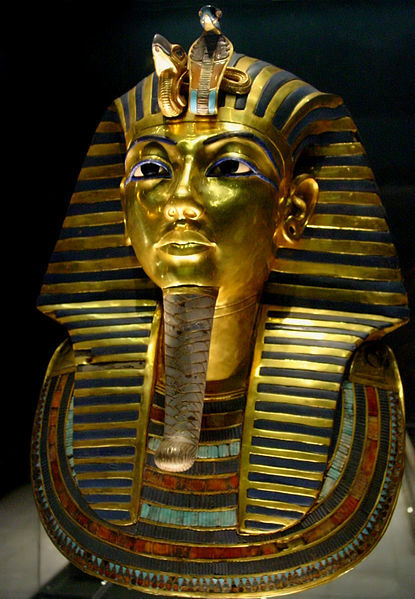 The 1922 discovery King Tutankhamun’s amazing burial crypt is evidence of that. King Tut’s burial mask, on display in the Egyptian Museum in Cairo, Egypt. Photo courtesy of Wikimedia Commons. Centuries later, other motivating factors were involved. In the early 19th century, as progress in science took place in leaps and bounds, medical school enrollment in Europe and the U.S. went through the roof. Students needed cadavers to learn anatomy and practice their skills on, but a dead body decomposes quickly. So medical schools needed, ahem, fresh material regularly and paid good money for it. Thus, grave robbery became common. But that juicy topic deserves its own post. Efforts were being made (especially in Europe) to try to preserve cadavers, but the use of certain potent chemicals such as mercury were harmful to the students making the dissections. That’s where Dr. Thomas Holmes comes in. A native of Brooklyn, N.Y., Thomas Holmes was frustrated by the ineffective means available to preserve bodies for dissection at medical schools. Born in Brooklyn, N.Y. in 1817, Holmes was familiar with this dilemma. As a medical student at the College of Physicians and Surgeons at Columbia University, he eventually studied with a phrenologist. Phrenology was a pseudo-science that advocated that the size of certain areas of the brain indicated strengths and weaknesses. Most of this was based on outside brain measurements since studies of the inner neurological workings of the brain were barely begun. For instance, if you had a large forehead, you were supposed to be very intelligent. I must be a genius if that’s true, by the way. 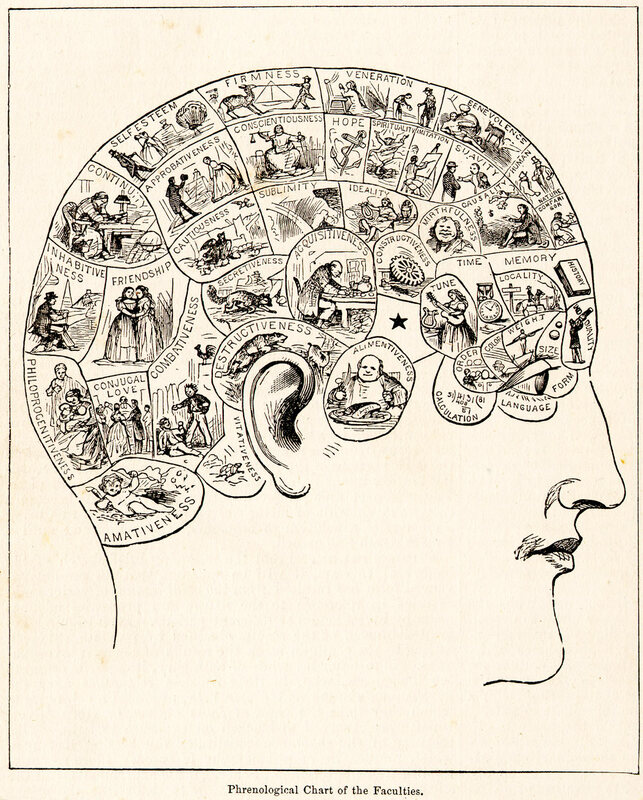 A phrenology diagram from 1883. Phrenologists thought the human mind has a set of different mental faculties, with each particular one represented in a different area of the brain. Photo courtesy of People’s Cyclopedia of Universal Knowledge. While studying the heads of Egyptian mummies, Holmes realized this ancient civilization had solved the problem of preservation without using deadly chemicals. In Europe, they were already practicing a form of arterial embalming by replacing a cadaver’s bodily fluids with alcohol as a preservative (which wasn’t working very well). So Holmes invented his own arsenic-based solution (the toxicity of arsenic was unknown at the time), along with a patented fluid pump, and started using it. Holmes’ timing could not have been better. The Civil War loomed large and the number of casualties whose families were requesting to be shipped home for burial was staggering. You can imagine the dilemma this presented in terms of hygiene. As a captain in the Union Army Medical Corps stationed in Washington, D.C., Holmes got his chance to show off his new technique after the death of Colonel Elmer E. Ellsworth. A friend of President Abraham Lincoln, Ellsworth was also the first officer to be a military casualty of the Civil War. On May 24, 1861, he was shot while removing a Confederate flag from the roof of a hotel in Virginia. Holmes offered his embalming services for free. Ellsworth’s body was embalmed and displayed to the public at his funeral, and people were impressed with his “lifelike” look. As a result, Lincoln commissioned Holmes to start training “embalming surgeons” to take to the battlefields so deceased Union soldiers killed in action could be safely preserved for delivery to their families for burial. The Confederate Army never adopted the practice. Dr. Richard Burr, an embalming surgeon in Frederick, Va., is shown embalming a soldier recovered from the battlefield. Embalming tables were not usually available in the field, so he used a door placed over two large barrels. 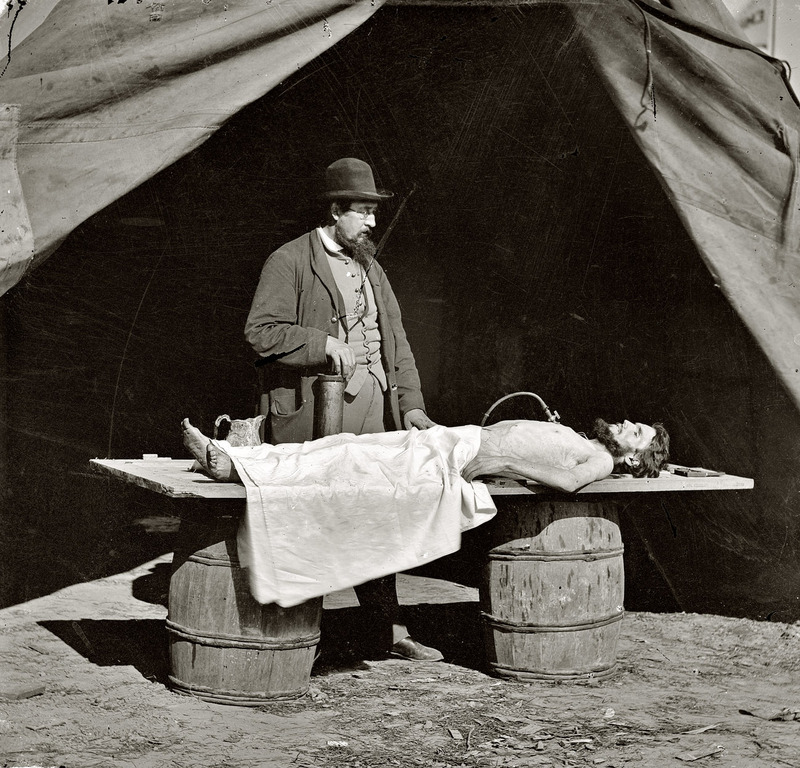 Photo courtesy of the National Museum of Civil War Medicine. The demand for embalming services became so great that some unscrupulous embalmers actually competed for corpses on the battlefield. The Union army offered an $80 fee for the embalmed body of an officer and $30 for a soldier. By 1865, the problem had become so bad that the War Department put out General Order 39 to ensure that only properly licensed embalmers would be allowed to offer services to the families of the war dead. 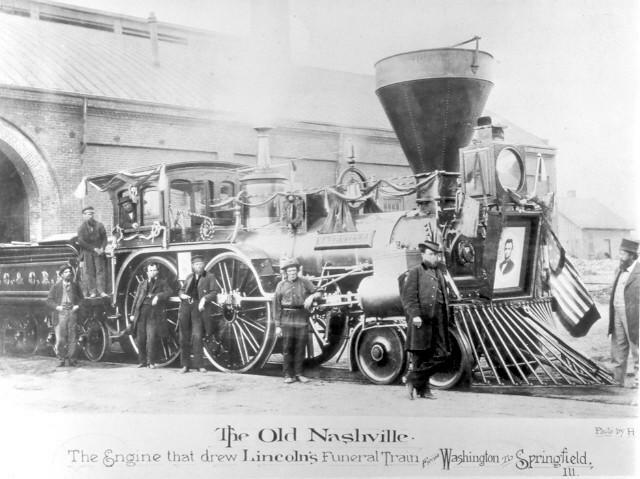 Postcard of Lincoln’s funeral train, the Old Nashville, that carried him across seven states and through over 400 communities. Many Civil War embalming surgeons went on to become morticians. 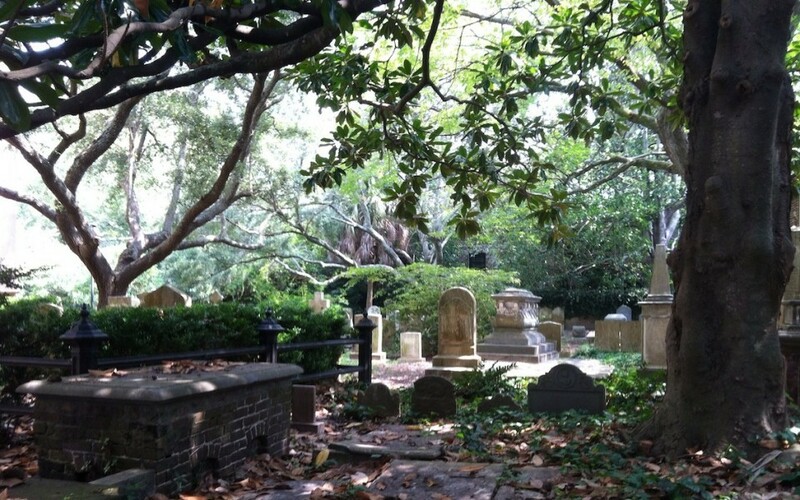 The next few decades saw a tremendous rise in the development of the funeral industry, including the use of open-casket funerals and “wakes” (as opposed to burying the body as quickly as possible). Holmes’ embalming fluid and his patented fluid pump were in high demand as more and more people began asking that their loved ones be embalmed prior to burial. Despite Holmes desire to provide a safe process in which to preserve a corpse, there were still health risks involved. His embalming fluid contained dangerous levels of arsenic, which continued to be used for embalming corpses until well into the 20th century when formaldehyde was eventually adopted. Formaldehyde has its own risks, now classified as a known human carcinogen (cancer-causing substance) by the International Agency for Research on Cancer and as a probable human carcinogen by the U.S. Environmental Protection Agency (EPA). As a result, funeral directors implemented more stringent safety controls when using it, such as providing better ventilation during embalming. Less toxic alternatives to formaldehyde are now available, but many funeral directors are quite attached to it. They claim that nothing else gives human flesh the life-like appearance they strive to produce so families can hold open-casket funerals for their loved ones. At the same time, as a growing number of people pursue their desire for a more environmentally-friendly funeral, more funeral directors are working with families to meet their needs in this area. 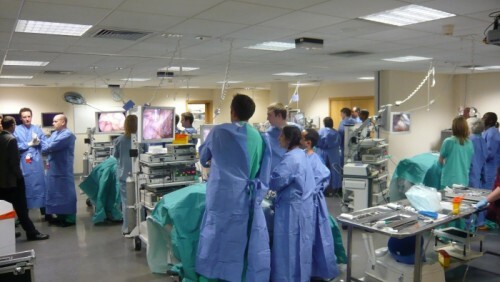 Students at the University of Dundee in Scotland are studying a new method of embalming medical cadavers. Invented by Austrian Walther Thiel, it requires far less formaldehyde than traditional embalming. So what happened to Dr. Holmes? He retired to Brooklyn after the Civil War, where he sold root beer and embalming supplies (a curious pairing). Holmes decorated his home with samples of his Civil War era handiwork. Embalmed bodies were stored in the closets, and preserved heads sat on tables in the parlor. A few years before he died, Holmes took out ads in mortuary trade journals with his latest invention, a canvas body bag that could also double as a sleeping bag. Not surprisingly, this last innovation never really caught on with the public. Holmes reportedly went insane, spending his final years in and out of institutions. One can’t help but wonder if it was partially due to his exposure to arsenic over the years. The ultimate irony is that Holmes specifically requested that his body NOT be embalmed after his death, which occurred on January 10, 1900. Why he did so is a mystery even the talented Sherlock Holmes couldn’t solve. Thank you for the time and research. Would you be able to direct me to the primary source for the wood cut engraving of Dr. Thomas Holmes? I am doing a research project on him and wanted to include an original image. Hi, Richard! I try to document all of my sources as best I can, including photos. As I recall, this image was on a Civil War web site and there was no source for it at all. The few times I have seen it online there has been no original source attached to it. I wish I had a better answer for you. Hi, Dave! Let me know when you finish your dissertation, would love to read it.